Beachfront, 4 bedrooms with en suite baths & deck access, game room with pool table, and more! Spacious and modern, this gorgeous vacation home is ideal for couples or families. Lots of deck furniture, an open floorplan with panoramic Gulf views and a game room complete with a pool table ensure a fun & relaxing getaway. The well-equipped kitchen with a double oven makes meal prep a breeze. When you're ready to get some sand between your toes, the beach is only steps away! NOTES: The elevator does NOT access the upper level. Check the amenity list to see all amenities for this property. Wonderful home. Well stocked kitchen, comfortable beds, great location. My family loved it! We've used Sand N Sea for years, and in general, we've always had good experiences. 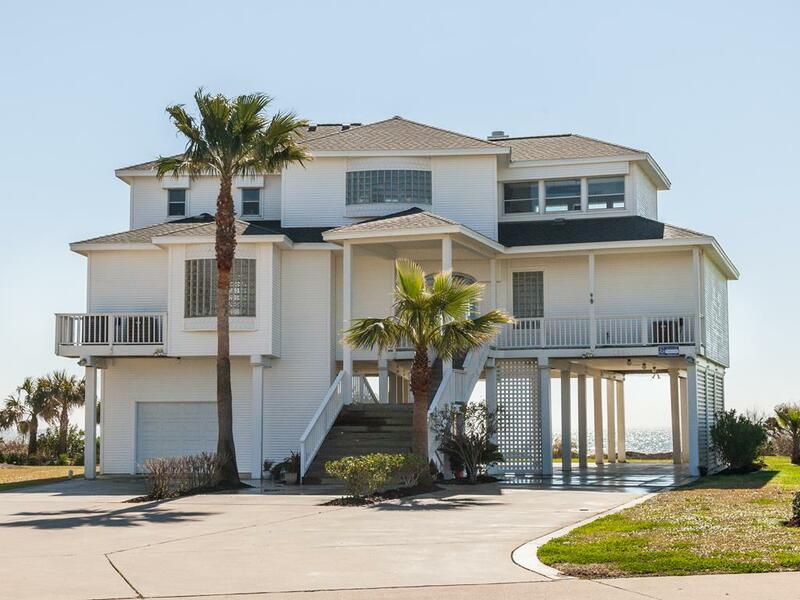 Comfortable home with everything one needs to enjoy wonderful Galveston! Really nice house with an amazing view. The house is well appointed and the kitchen has everything you need. The Ice Maker is a really nice touch in the Kitchen. I can't say enough about Coastal Dream....I didn't want to leave! It's so comfortable and inviting. It has beautiful views from the many balconies. Home is in need of some minor repairs. Back door lock is broken. Open ceiling area in master bathroom around ceiling vent/fan. Cute house! This home is large enough for privacy, yet cozy for gatherings. Location, amenities and a beautiful beach brought us back for a second year, and we are planning a third. This home is beautiful. The view of the beach/ocean is just awesome. The beds are comfortable, and there is plenty of space to relax. The grounds are well maintained. It was the perfect property to completely wash away all my stress!! I will definitely be back. this house worked great due to my mother being knee problems. the elevator was perfect. the view was just awesome as well. we will definitely be back! The house is as pictured and described. Our family enjoyed the stay. There were extra pillows and blankets. The elevator is located in a garage to which we had access. We had access to life jackets, boogie boards, water skimmers and water noodles. There was also a volleyball net we set up one day. We were also able to lock up our fishing equipment at night. The parking at this property is excellent and allows for well more than the subdivision allows. I don't understand the 4 car restriction at this particular property. There is also an ice maker in the kitchen that never ran out! We will definitely rent this property again. This is a beautiful, comfortable, spacious home for our group of eight. Bountifully furnished with decor, kitchen accessories and beach stuff. The location is perfect - the clean, scenic beach is just steps away, and the deck views and breezes were inspiring and relaxing. We hope to return again and again. ALL the Sand 'N Sea personnel we encountered were so friendly and helpful. Thanks Annie, Sarah, Rachel, Raven, Malissa and Billy and his co-worker with the DVD player cable. House was awesome, Had an elevator that helped my parents that are elderly. Plenty of space and a.c. system worked well.would definitely rent again. We love this property. The home, the windows and and the view are heavenly. Being on the water is wonderful too as we have kayakers and fishermen and the beach is just a few footsteps away! Lovely home. Great beach access. We will be renting Coastal Dream again. I highly recommend staying at Coastal Dreams. The house is beautiful and the kitchen has everything you could possibly need. The elevator was a life saver for my elderly father and transporting all of our family's luggage and groceries. It's perfectly located on the beach and just outside of Galveston proper. Wonderful memories were made with our children and grandchildren! Outstanding view. Relaxing atmosphere. Comfortable sleeping arrangements for large family. This home has a huge living/kitchen area which is idea for families/groups. This area has windows the length of the house with a beautiful view of the ocean. Each bedroom has an ensuite bathroom with access to a patio and amazing views of the ocean. The house is very well stocked with kitchen & cleaning items and was very clean upon arrival. The elevator was a huge plus and made unpacking an packing a breeze. The walk across the dunes to the beach is very short. The customer service provided by Sand 'n Sea was top notch. We had one maintenance issue to deal with on the first day of our arrival, and Sand 'n Sea went above and beyond to correct the issue, and they acted immediately! Coastal Dream is a beautiful property and has an outstanding view from all rooms. I've already booked my stay for next year at this same property! One of the better homes we have stayed at in the Sand & Seas properties. The only drawback is the mattresses are very hard. Coastal Dream is a great property. There is plenty of room and has anything & everything you could want. Since my husband & I have a hard time on stairs the elevator is a definitely plus. Also the proximity to the beach is very nice. This home is beautiful. It is right on the water so it is good for the fishermen and all water activities. The porch is large and a great place to gather. The home is decorated nicely and it is very peaceful place to stay! We loved our stay at Coastal Dreams and the house was perfect for our family. Plenty of room and the house was well supplied with needed accessories. This is an excellent property in regard to space and proximity to the beach. My family loves this house so much that one of my grandsons made the comment that he had missed being at this house and the other one said it felt like home. My children told me if we couldn't get this house they didn't want to go to the beach. That is how much they love it. The Coastal Dream was truly a Dream!!! We have stayed at many Sand -n- Sea properties and this beach house , by far, was the ultimate vacation house!! House is very open and welcoming. Deck off the main living area is an enjoyable space w plenty of comfortable seating. We especially appreciate the elevator which is needed for one of the older members of our group. A lovely, spacious home which accommodated our large family well. This is a beautiful house, very comfortable, great location, close to Seawall and attractions. Would definitely rent again. With it's pale blue interior and sweeping views of water from nearly every room in the house, I get a feeling of peace and relaxation from the moment I step in the front door. We've stayed here four summers and plan to come back. great location, kid friendly home, wonderful views! The house is lovely and has lots of nice amenities. We especially like having an elevator available. The proximity of the house to the beach is great especially for us older folks. We simply love this house. We have found the Coastal Dream to be very roomy, comfortable and inviting. The elevator is a must since one of our party has difficulties w stairs. It is also a pleasure for the rest of us when we have a number of items to take into or out of the house. Love the windows with their great view of the sky, beach and water. Property is well equipped and maintained both inside and out. Although rarely needed, there always seems to be a staff person available. My husband and I along with my father-in-law stayed at Coastal Dream October 2010. The house is perfectly located and was peaceful and quiet. The main living area has spectacular views and all rooms have their own decks, which was a huge plus. My mother also visited for a few days and there was plenty of room. This house has a very convenient floor plan and comes equipped with plenty of kitchen utensils, dinnerware, appliances, etc. Each guest room has its own bathroom and there is a 1/2 bath downstairs for everyone off the main living area. Perfect! This is definitely a home away from home. The elevator and easy beach access made it so simple for my elderly parents to get their toes in the sand again. We had booked a different property to begin with but changed to Coastal Dream. I'm could not be happier that we did. Thanks to all the Sand N Sea agents for always making our vacation a pleasant and easy adventure! Beautiful property right on the water. Was afraid that it was too good to be true. Found it to be just as described. Book it. You will not regret the choice. We have stayed at a few rental properties and this is by far the best one. The house is well kept and in good working order. The owners do a fantastic job of providing a comfortable home for the guests. OUTSTANDING HOME IN OUTSTANDING LOCATION. Been there twice and will be back again. A beach house that feels like a home! Great house, location and view. After spending several hours packing and getting to Galveston, my feeling on entering this house was, "Aahh." Peaceful, restful, a feeling of coming home. The house is open, comfortable and well maintained. Has good beds, plenty of hot water and a well equipped kitchen. Loved the elevator. We appreciated the privacy of the beach and the quiet surroundings. Was a most enjoyable time.